I have four boys between the ages of 22months and 10. They all love the outdoors. I take the older two hunting with me during early hunting season when it’s a bit warmer. They love to hike and my 10 year old absolutely loves kayaking. They can’t get enough of hiking in the wilderness. This year I started a new tradition where I’m going to be taking each one of my older three boys on their own three day weekend adventure. I plan on doing this every year from now on. They can’t wait. This way we can get some one on one time (hopefully get them more comfortable talking to me and prepare them for their teen years) and I can also tailor each trip to each of my sons’ abilities and likes. This month I will be taking my older son. We are going to kayak out to an island where we will camp for three days. We will do a lot of fishing. He is a natural when it comes to fishing. He had all kinds of trouble trying to fish with those cheap kids combos so one day I gave him one of my fishing poles and off he went. He could cast it farther than a lot of adults and he’s caught some nice size fish all on his own. The area where we are staying is surrounded by over 2500 acres of state forest which is full of trails and streams. So we will be spending a bit of our time hiking as well. I don’t know who’s more excited him or me. All of my kids love being outside but my 22 month old can’t get enough. All winter he would just trudge through the snow and didn’t care how much effort it took or even how cold it was. Now that it is nice outside he doesn’t want to be anywhere but outside. He loves to help feed and water the chickens. It amazes me how much he can actually do all on his own! On Mother’s Day after we had dinner the kids and I were out walking around our property. We have a section of our property that has a steep hill in the woods that is mostly loose dirt and tree roots. He was climbing up and down the hill without any help and never fell once. None of our kids could do that so early! This kid has amazing balance. I wish I had a picture of this hill so that you could see it. I say all this to encourage people to get their kids out hiking and enjoying outdoor activities as early as possible and to do it as a family. I had my older son sitting in my lap well kayaking before he could even walk (he had a life jacket on and I had a long daisy chain hooked from the top of my lifejacket to the bottom of his). He loved it. Children are much more capable than we think. You’ll never regret the time spent outside with your kids but you’ll always regret the time wasted on TV and video games. They will always cherish those memories as well. I still remember all the camping and fishing trips I took as a kid. Those are the memories I cherish most. 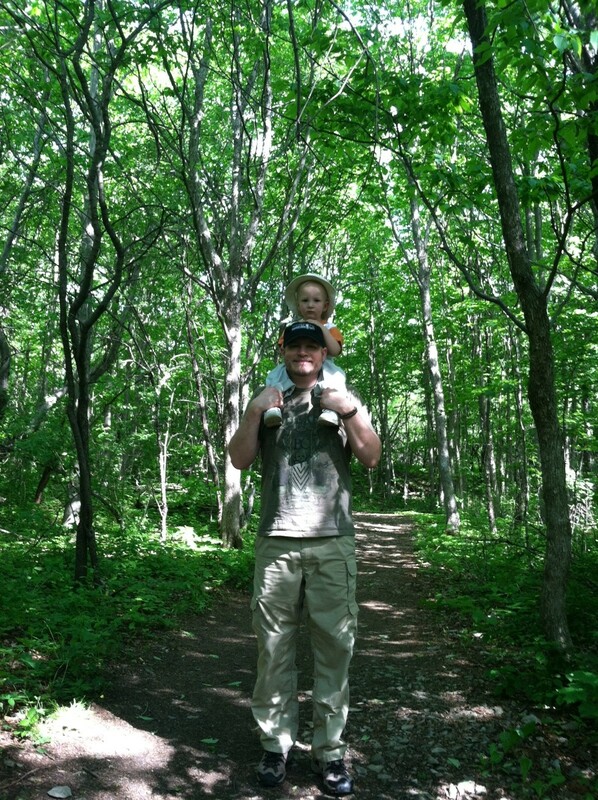 Below are some pictures of us hiking on a well worn trail system on Memorial Day. What activities does your family like to do outside together? 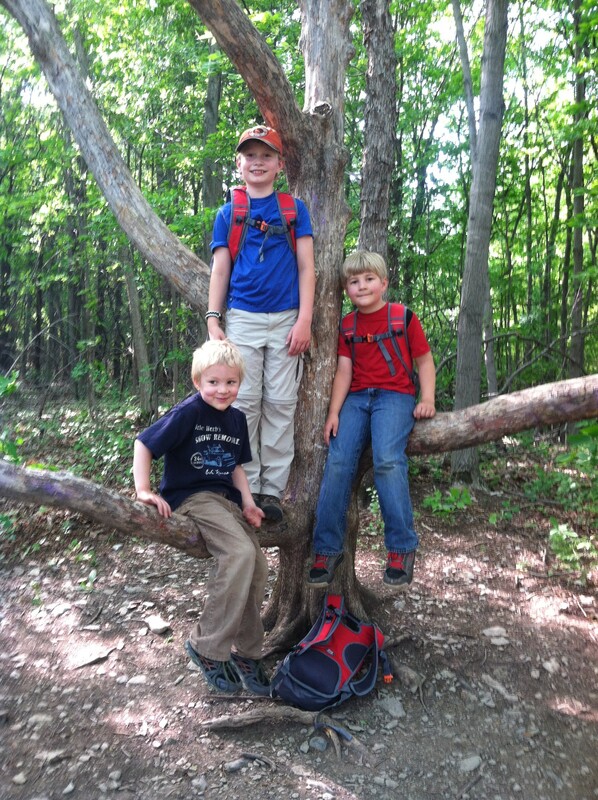 Do your kids like being outdoors? 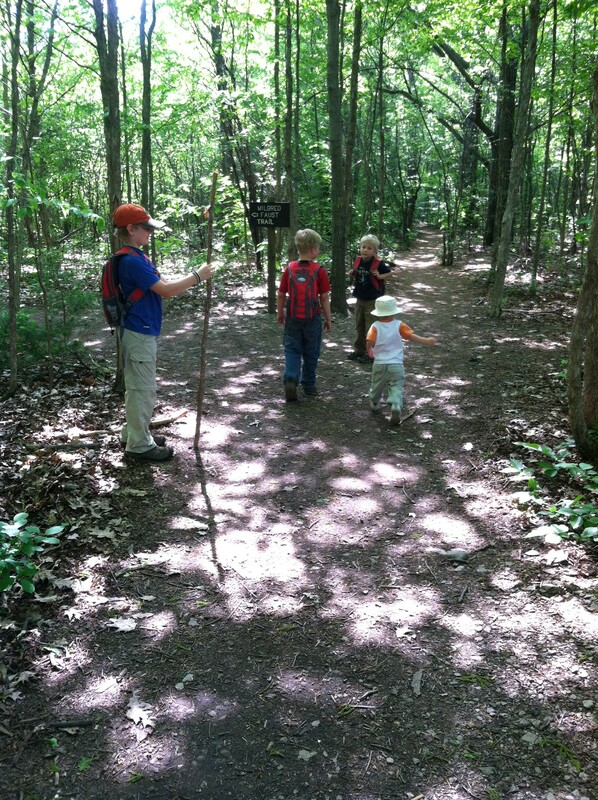 If your family is not use to hiking or being outdoors regularly, start small. A simple hike down a short trial will do wonders. Don’t try to start out with more than you or they can handle. Start small and enjoy working your way up to more difficult hikes, camping trips or backpacking trips. Enjoy the process together. You’ll also get to see some breathtaking views along the way. 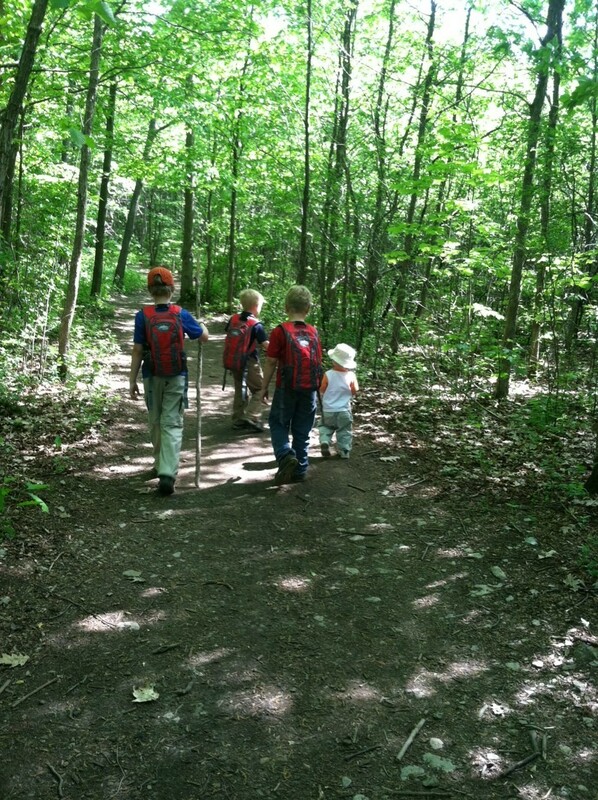 Just an FYI, we have each of the older three kids carry their own hydration bag. This works out very well. They can easily carry their own water, snacks and lunch. We tried having them just carry containers with water in them but not too long down the trail they would get tired of carrying the containers so we found that this works our well for us. Also, with boys you will need snacks. Don’t venture out without some. If they are not eating they are thinking about eating! Our boys eat more than my wife and I do. Anyway, enjoy the time spent outdoors with your kids and don’t underestimate their abilities.